Pours a hazy golden color on the pour. There's a nice half inch of frothy white head. Smell is some yeast, some light spice and some floral hops. Taste is more of what was found in the nose. Just like the other Bullfrog beers I've had. This has a velvety smooth, creamy mouthfeel that I absolutely love. Decent amount of bitterness. Just a simple, well done beer. Can't find any faults in it. For what it is, it's well done. I could drink an awful lot of this stuff. I recieved this beer in a recent BIF. 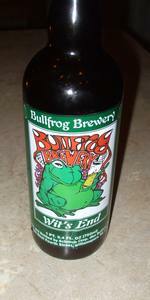 I love me some Bullfrog and the chance to try some new ones just cannot be passed up! Served cold and poured into a pint glass, this one was consumed on 04/30/2009. The pour was nice. Very hazy and cloudy light yellow in color with a rich head of two inches of white foam. Very nicely done here with a smooth fade into a a broken crown of white across the top. Light aroma, apricot, grains, light spices, again nicely done and a bit different then what I was expecting, but a little bit light. This was almost like a light Saison. Smooth even carbonation with a light grain flavor acceneted with hints of peach and apricot and a light touch of grass in the finish. As it warms even more light wheat and grain flavors meet me in the finish,. Very clean, very light bodied and very drinkable. Overall while not the most complex beer in the world, something I could drink a few of without batting an eye. This was a solid summer session beer if I have ever seen one. 750ml caged and corked bottle (that cork was a pain to get out!). Poured a lighter and hazy straw color with a larger sized white head. Aromas of wheat, citrus, grassy, cereal grains, coriander, and other spices. Tastes of citrus, the same graininess, wheatiness, spices, and had a lighter sweetness to it (honey?). Thanks to mymrnngjckt for sharing a bottle of this at our recent beer club gathering. Poured from a corked and caged 750ml bottle into my snifter glass. Appears a mildly hazy muted yellow color with about a finger of bone white head. Smells and tastes of spicy yeast, orange, coriander, wheat, and flowers. Very mild and light tasting for a witbier, and that's an understatement. Light bodied with medium to moderate carbonation. This beer goes down nicely, but there's just not enough going on in the flavor dept. to make me crave more. I usually stir up the yeast in the bottle before poring my wit's and I'm not sure the yeast was stirred up prior to pouring this. So, I'll give this one the benefit of the doubt for now until I can get another taste. For now, this is a let down, especially considering the high price these limited Bullfrog bottles command.